Eugene Alves isn’t your typical League1 Ontario player of the week. In Durham United’s 4-1 victory over the Kingston Catarqui Clippers, Alves made several key saves that enabled his side to mount an impressive second half comeback. Alves, one of the more cultivated players in the league, expressed that receiving an honour of this stature is a bit different. “For me it’s not about going and playing at the highest level, for me it’s about the development of younger guys,” Alves said. Alves spent four years playing at the NCAA level for Kent University, before spending two years professionally with the New York/ New Jersey MetroStars – now referred to as the New York Red Bulls reserve team. Oddly, despite Alves’ success, it’s key to highlight that his goalkeeping career arose in a fortuitous manner. “I was a centre-midfielder in high-school until our keeper got hurt, and they wanted the tallest guy in goal, so I volunteered as I was the tallest guy by far and athletic,” Alves offered. While injuries may have hampered Alves’ professional career, the Durham United player now gives back to the youth with his goalkeeping expertise. Alves is currently the head goalkeeper coach for the Oshawa Kicks Soccer Club, University of Ontario Institute of Technology, Durham Region Soccer Academy, and Director of Goalkeeping for the Oshawa Kicks Soccer Academy. Ultimately, Alves utilizes his League1 Ontario experience to remain in shape, but also to help his younger teammates – and the players he coaches – reach the next level. 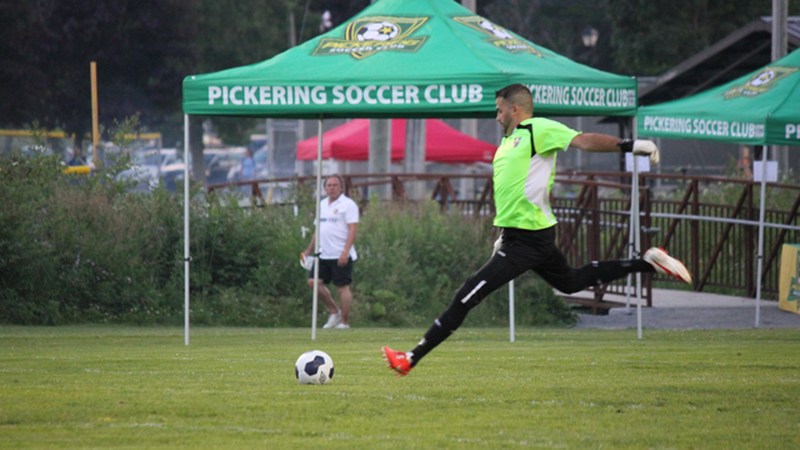 Likewise, Alves’ goal to improve youth development and grow soccer in Canada correlates with Pickering Soccer Club’s initial aim to ensure Durham soccer players receive the environment to mature in the Durham region. “Durham region is very big, and we have a lot of great players, teams, coaches and youth systems in this area, but they all tend to play out west in Toronto,” Alves stated. The energetic Alves believes his side has represented the Durham region in a competitive and professional manner thus far, accepting the challenge of gelling as a team in their inaugural season with hopes of finding the correct balance in the final stretch of their campaign. Equally, Alves is in full support of League1’s initiative. “This league is great and it can only get better. I think they have the right idea as there’s finally a pathway to the professional level,” Alves said.